In an article earlier today I noted how corporate buybacks over the last two plus years have far outpaced U.S and foreign investors' outflow from equity investments. 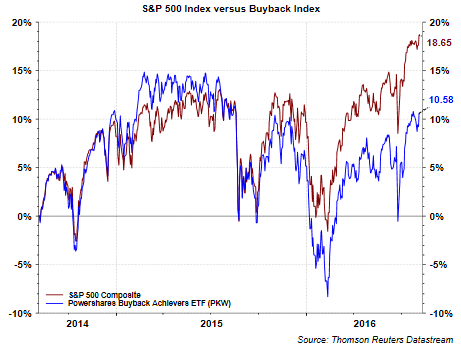 This strength in buybacks has not translated into outperformance for these buyback firms relative to the S&P 500 Index though. As the below chart shows, the cumulative total return performance of the Powershares Buyback Achievers ETF (PKW) has lagged the cumulative total return of the S&P 500 Index during the last two years. As background, the US BuyBack Achievers Index is comprised of US securities issued by corporations that have effected a net reduction in shares outstanding of 5% or more in the trailing 12 months. The underperformance became more pronounced beginning in the fourth quarter of 2015. Comparing the two year results above with the one year returns shows the S&P 500 Index has returned 6.29% versus -.43% for PKW over the last 12-months. One headwind that has faced buyback focused investors is the yield differential on the buyback index versus say the iShares Select Dividend ETF (DVY). The yield on PKW is 1.4% and DVY has a yield of 3.0%. In this environment where investors prefer income, PKW's yield is even lower than the S&P 500 Index's yield of 2.1%. Historical stock buyback activity can be found at my post, Stock Buybacks Up Double Digits In First Quarter.